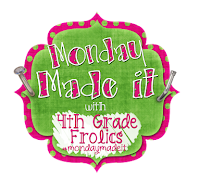 Pinkadots Elementary : Monday Made It: Featuring my lovely welcome cards! Monday Made It: Featuring my lovely welcome cards! Well the time has come... I had to hand in my laptop today at school. I am heartbroken. My MacBook Pro was my BABY. I don't know how I am going to survive without it for the month of August. 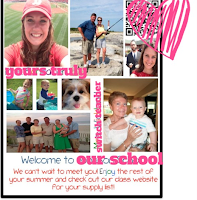 I won't be able to create anything else for my classroom, TpT, and I'm sure my blog posts are going to look less attractive. Can I even link up using an iPad? Anyways since I just got my class list, I wanted to send home a welcome note to the students. I've done this in the past, but this was the first year I used Costco to print. It was ready within 24 hours and came out AWESOME! I thought the size was going to be a small notecard, but it was actually a 5X7 and even came with envelopes! Since I only teach Reading/Writing/LA, I have a switch partner who teaches Math/Science/ and S.S. I love teaching this way and I love having two classes of kids. I blocked out our last names and school name (so I promise, it looks MUCH better in real life). I just made a quick collage on Power Point, sized it to fit the card and printed them at Costco for $14 for 50 cards & envelopes! The tricky part is, I am not a Costco member, but luckily my partner teacher is and she was nice enough to pick them up for me. I created some quick address labels and mailed them off to my students today. I know our students are going to LOVE getting mail and having a look at their teachers. Our school only houses 4th and 5th grades so normally the students have no idea who I am until they meet me on the first day. I wish we had a meet and greet earlier on. Hopefully this will take away some of their jitters! 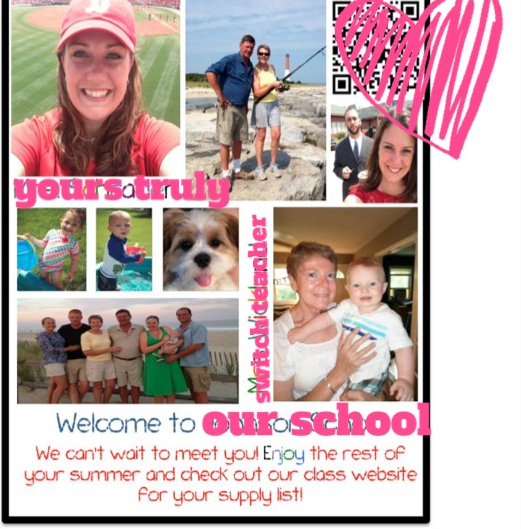 When students scan the QR code, they hop to my class website, which shows the supply list! Clever, huh? :) Anyways, I'm kinda in love with them! Those cards are a great idea! Love the QR code. Brilliant. Sorry to hear about your Mac! I am turning in my Dell dinosaur in a few weeks for my Macbook Pro. Can't wait. Your welcome cards are adorable. We don't find out the names of our kids until a couple of days before they come in for sneak peek (which is tomorrow). I'm sure the kids will really enjoy the fun introduction. What a great idea! We usually don't have our official class list until a couple of days before school starts. There is no "meet and greet" either. I've always wanted to do something like this. Thanks for such a cute idea!